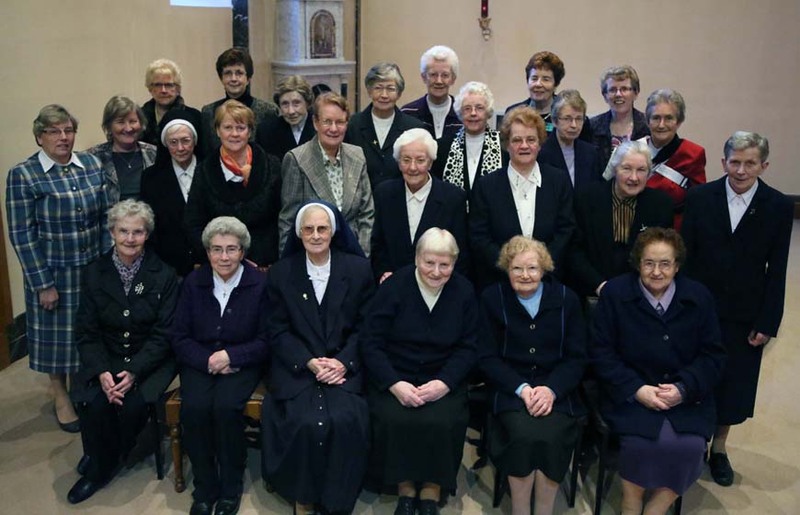 On Monday, February 25th – the Parishioners of the Cathedral Parish along with the Priests of the Diocese had a special Mass to thanks the Sisters of Mercy for outstanding Service to the parish of Tuam. Front Row: Sisters Maura Nolan, Immaculata Ryan, Philip Divilly, Anthony Ruane, Hilda Mannion, Síle Lohan. Second Row: Teresina Daly, Suzanne Ryder, Sebastian Dolly, Anne Farragher, Geraldine Costello, Loreto Slattery, Finian Fallon, Helen Scarry, Damian Conroy. Back Row: Mary Clancy, Nancy Clarke, Brid Caulfield, Patricia Fahy, Mary Hennelly, Assumpta Cahill, Mary Corr, Geraldine Larkin, Teresa Nolan, Agnes Curley. 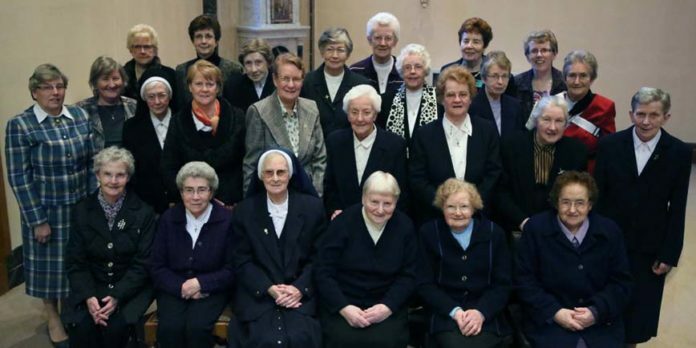 HOMILY TO MARK THE DEPARTURE OF THE SISTERS OF MERCY FROM TUAM – FEBRUARY, 25th, 2013. Joining with the Administrator, Fr. Francis Mitchell, Frs. Seán Cunningham and Shane Sullivan, and with the priests who ministered here in the past, with the Presentation Sisters and the people of Tuam, I welcome Sr. Elizabeth Manning and all the Sisters of Mercy. We come to express our gratitude to the Sisters for what they have done, for what they have meant to the people of Tuam for 167 years. Our celebration is tinged with a certain sadness because we say farewell to the Sisters who were the very heartbeat of this community over the years. In my foreword to Fr. Kieran Waldron’s riveting book “Out of the Shadows” which dealt with the emerging secondary schools in the Archdiocese of Tuam, I referred to “the story of visionary pioneers”. These were people who put everything on the line in their determination to make hope a concrete thing, to make dreams come true, “this is the story of the Sisters of Mercy here in the ecclesiastical capital of the West”. As the Sisters set foot here in Tuam from Carlow, the great famine was raging. A recently published Atlas of the famine indicates that 84% of Tuam population was receiving relief under the Soup Kitchen Act of 1847. The Annals of the Sisters of Mercy testify to the way in which the Sisters worked and the sacrifices they made in caring for the poor and famine stricken of the area. As the Sisters leave Tuam I wonder if we are not experiencing a famine of a more subtle and sinister kind in our society and our culture today. Putting The Works of Mercy into action! The Sisters immediately set about the works of mercy as their first ministry. They valiantly tried to relieve the hardship, mostly be supplying a meal of hot porridge to as many families as possible. Two years after their arrival cholera broke out and some of the Sisters spent their days in the hospital nursing the sick and helping to bury the dead. The Sisters paid special attention to the visitation of the sick and the poor in their homes. The Annals of the Sisters of Mercy record the number of visits made and the help that was given for each month. Spiritual and material help, comfort and counselling, characterised their visits. Such were the conditions at the time that many of the Sisters died young after only a few years of service. Since that time visitation on the part of the Sisters of Mercy has been a regular feature of their apostolate right up to the present day. We hear so much about the new evangelisation. The word itself is quite abstract and has lost the flavour of the Greek “good news”. The idea is captured in Luke’s Gospel “you are witnesses of these things” (Luke 24:48). What does it mean to be a witness? I am witness not simply if I see something, not simply if I affirm that something is true. I am witness if I do both: if I testify to something I have myself experienced. This is what the Sisters of Mercy have been doing over those years. I am reminded of the first letter of St. John when he said “that which was from the beginning, which we have heard, which we have seen with our eyes, which we have looked upon and touched with our hands, concerning the word of life – the life which was made manifest, we saw it and we testify to it, and proclaim to you the eternal life which was with the Father and was made manifest to us – that which we have seen and heard we proclaim also to you”. (1 John 1:1-3). The Mercy Sisters have testified to all outside of their walls to what they have seen, they have proclaimed what they have heard, they testify to what they have touched. All who have come into contact with them have got very definite signs that they have experienced what they are proclaiming. They have moved hearts in that they have remained in close contact with the Lord, they have been fired by his presence and have experienced his presence in themselves, and in the Eucharist which was central to their lives. For over a century and a half the people of this town have been moved by their faith. Education has been synonymous with Mercy Sisters. This began in the aftermath of the Great Famine. Their contribution in this is monumental and something which those who speak and write about education today might well research if they wish to get an informed view. Girls were trained in the art of ‘home management’ and developed skills like lace-making, crochet and knitting. The girls of the Tuam area received an education which enabled them to take their place in societies here in Ireland or across the world. Here they became convinced of the value of education, developed skills and acquired family values which would enable them to become mothers of tomorrow and the ones who would be responsible for building the society of the future. This was all part of the outlook of the Sisters of Mercy and their ministry. The Sisters were all too conscious of the steady sinister haemorrhage of emigration from the West. Many those leaving were almost without education and frighteningly vulnerable as a result. The challenge facing the Sisters of Mercy might have broken a smaller people, but the Sisters who responded to the challenge were giant-hearted indeed. They confronted the harsh world and they did so with the physical, intellectual and above all spiritual tenacity which produced results. The price was one which they paid in terms of back-breaking work and endless worry. The Sisters here in Tuam did not confine their ministry to the classroom. Their work was woven into the very fabric of our society. Indeed such was the zeal and witness they provided that requests from priests and parishes were coming regularly to the Reverend Mother to open convents and schools in other towns in our diocese – Claremorris, Louisburgh, Coláiste Mhuire in Tuar Mhic Éadaigh, Glenamaddy and across the Atlantic to San Diego in Carifornia. They pioneered Adult education in the community; they were at the coal-face of the social services and care for the elderly. They put in place a wide range of services and supports, leading to ‘meals on wheels’ housing schemes for newly married couples and the elderly. Their work in this regard was heroic and monumental. In so many ways they made others aware of the importance of education. The quiet work which they did in pastoral outreach and the confidential way in which they supported struggling families is known only to the Sisters themselves and the families they helped. People who were over-whelmed by troubles of one kind or another approached the Sisters for prayer and for help. These people were enormously comforted and strengthened by their visits. The Sisters had a special care for those who were poor or sick and in need. That care was provided courageously, with great courtesy and discretion. I was privileged to witness the deep spirituality, the lives of quiet prayer and devotion that inspired and underpinned it all. I was moved and enriched by it and will be forever grateful for it. I know that I am reflecting the sentiments of the whole community when I state this. Here in the parish they have been involved in so many areas with various committees in different ministries, with the pastoral council. I am reminded of the Second Letter of St. Paul to the Corinthians, a text with which the Mercy Sisters would have identified. It goes as follows, we are “as unknown, and yet well known; dying, behold we live; as punished, yet not killed; as sorrowful, yet always rejoicing; as poor, yet making many rich; as having nothing, yet possessing everything” (2 Corinthians 6:10). They have kept the lamp of love and faith burning brightly as they served God and the people of God unceasingly. It might come as a surprise to people today when they hear that over the years six extensions to St. Brigid’s Secondary School were built and these were financed from the salaries of the Sisters. Indeed the first grant-aided extension to St. Brigid’s was 1969. The education which the Sisters provided was all-embracing. It included music, choirs and orchestral music to the highest standards. Commercial subjects, such as shorthand, typing and book-keeping were taught in the early days. There have been many elements of change in their life and in the community to which they ministered during those years. But the more things change the more they remain the same. One of the elements of sameness that has sustained them in their ministry was their deep relationship to Christ as their centre. The word “commitment” could never capture the intellectual conviction and emotional ties which was characteristic of their lives. It involved loyalty, identification and participation; it was passionate with plenty of heart as well as head. It enabled them to reach out in faith to others and to the development of the society. Today many people ask if it is even possible to have commitment. People who “hang lose” and “play it cool” see commitment as particularly difficult, if not impossible. By contrast, by their lives, the Sisters have not only thought about faith, but they imparted and provided Christian witness. It was so hurtful for some of the sisters, and for all those who know the real story of their dedication, to see the way in which, on some occasions, all were associated with the misdemeanours of a small number. Some of the things that happened were deplorable but it was so unfair to regard that as representative of the Congregation. While there was evil and abuse and it was right that it be exposed and condemned, nevertheless that was a very small part of the story, an aberration and an exception. Wasn’t it Shakespeare’s Mark Anthony who said, in his oration at the death of Caesar “the evil that men do lives after them, the good is often interred with their bones”. Here in Tuam the Mercy Sisters were committed to the transformation of the people of the area and the Society. When you work for the betterment of the world and human society in such a way, you are promoting the kingdom of God and becoming witnesses outstanding in holiness, living witnesses to God’s unchanging love. As the Preface of the Mass reminds us “they inspire us by their heroic lives, and help us find our constant prayers to be the living signs of God’s saving power”. When the history of the Mercy Sisters comes to be written I feel confident that the enormous good done by them and done quietly, secretly, unselfishly, generously and constantly, by so many devoted and dedicated Sisters will be highlighted. On behalf of the people of Tuam the religious and the priests, I say a deeply felt and sincere thank you to the Sisters of Mercy. We thank you for the wonderful grace of your presence in our town for almost 170 years. We thank God for the families of the Sisters of Mercy who inspired their vocations and we thank God for all those whose lives were touched, healed and enriched by your presence, your prayer and your care. Tuam will be the poorer for your going, but the richer for your having been here. May God reward you for your goodness and may he abundantly shower his blessing on you in the future.